The Pancreas SPORE at Washington University School of Medicine in St. Louis (WUSM) aims to increase survival rates for men and women diagnosed with pancreatic ductal adenocarcinoma (PDAC). PDAC is the 4th leading cause of cancer death in both men and women, with only 6% of patients living five years after diagnosis. The investigators of the Pancreas SPORE at WUSM, in partnership with Siteman Cancer Center, a National Cancer Institute-designated Comprehensive Cancer Center, and Barnes-Jewish Hospital, have access to top-quality research facilities and resources, and see patients from a large geographical area. Each year, WUSM physicians evaluate 300 new patients with a possible PDAC diagnosis. The Pancreas SPORE has been awarded funds for four separate projects to work toward reducing pancreas cancer mortality rates and improve survival rates for PDAC patients. In collaboration with external investigators, WUSM investigators will work with John Hopkins University School of Medicine, the University of North Carolina, and the University of Rochester to address unique opportunities to improve care of patients with PDAC. 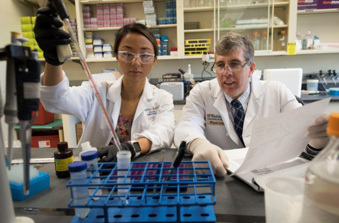 Right: William Hawkins, MD, FACS, works in the lab with a general surgery resident. Dr. Hawkins is principal investigator of a $10.4 million grant aimed at developing new treatments for pancreatic cancer. From previous basic and clinical work, Drs. Linehan and DeNardo were able to identify specific immune system responses that thwart anti-tumor immunity. Specifically, their research has identified chemokine receptor type 2 (CCR2) signaling as a significant regulator of myeloid mediated immunosuppression. In order to develop this approach into a clinical application, we will test the ability of CCR2-inhibition to improve responses to immunotherapy in pancreatic cancer in both human patients and mouse models. Researchers in this project hope to expand knowledge about how to selectively target drugs to PDAC and develop new drug delivery platforms to increase patient treatment success and limit toxicity. Drs. Hawkins and Lockhart established that a specific drug compound was able to localize treatment to PDAC cells in pre-clinical models. Tested in mouse models, this compound suggested that treatment was highly effective without being too toxic for potential patients. Future research will explore the lead compounds' possibilities in humans in hopes of creating a new drug and a delivery platform specifically for PDAC patients. If successful, the platform will provide other researchers with opportunities to improve pancreas cancer knowledge and future treatment options. Multiple genetic alterations have been found to be responsible for cell proliferation and survival in the large majority of patients with pancreatic ductal adenocarcinoma (PDAC). Drs. Wang-Gillam’s and Der’s project will analyze the specific pathways leading to survival and drug resistance and plan to develop personalized chemotherapy options for PDAC patients based on the dominant pathways in sub-groups of patients. They expect that research on these mutant pancreatic cells will lead to novel drug combinations for clinical evaluation. Exploring defined cell pathways using this technology could also be applied to other cancer sites to help reduce mortality and improve patient outcomes in future research. In this project, Drs. Gillanders, Schreiber, and Jaffee will work toward creating a personalized pancreas cancer vaccine for PDAC patients. Based on innovative research from Dr. Schreiber, researchers have a better understanding of the interaction between developing tumors and the immune system. With this knowledge, Drs. Gillanders and Schreiber will be able to identify and prioritize antigens that may be successfully targeted and killed by a personalized cancer vaccine. This personalized cancer vaccine will be tested in a clinical trial alone and in combination with other immune modulatory therapies. The Pancreas SPORE offers research opportunities through the Career Enhancement Program and the Developmental Research Program. The Career Enhancement Program provides financial support and mentoring for investigators who are new to the field to help build translational research careers in pancreatic cancer. The research initiatives funded by the Career Enhancement Program are expected to have a major translational component, focusing on etiology, prevention, diagnosis, early detection, treatment, or population science in pancreatic cancer. The Career Enhancement Program is open to all institutions participating in the SPORE. The Developmental Research Program recruits and supports developmental research projects in pancreatic cancer for future incorporation as full SPORE projects or as the basis for applications for other major peer-reviewed funding. The types of research projects include basic research, clinical research, epidemiologic studies, and cancer prevention and control in pancreatic cancer. These projects expand the scope of translational research and increase the number of investigators committed to pancreatic cancer research. The Developmental Research Program is open to all of the institutions participating in the SPORE, and to any of their collaborators, to maximize the number of innovative and high-quality projects. The Administrative Core provides executive oversight and administrative support for all of the Pancreatic Cancer SPORE projects and cores at Washington University School of Medicine in St. Louis. The Biospecimen Core collects, stores, processes and distributes biospecimens from adult patients referred to Siteman Cancer Center at Washington University School of Medicine and Barnes-Jewish Hospital with newly diagnosed PDAC to facilitate biospecimen-based translational research. The Biostatistics Core provides the statistical design, data management and computational support for all Pancreatic Cancer SPORE investigators and projects at the institution.